The Antriksh Group is one of the most reputed real estate developers in North India. The reputed group has provided a number of successful projects in the past years. They have many running projects that again aim at making housing easy in a place like Delhi. The property rates have always been in high given Delhi is the country’s capital city. 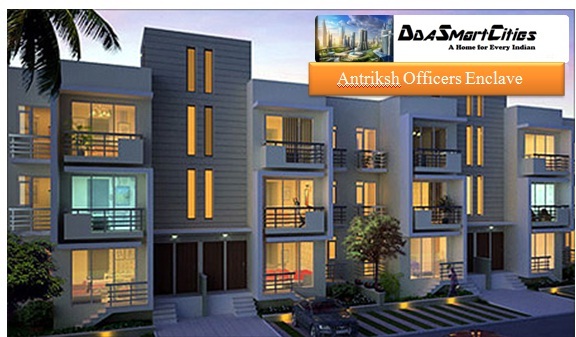 The Antriksh Officers Enclave is another ongoing project in the L Zone Dwarka region. The housing plan offers 1BHK, 2BHK, 3BHK and 4BHK flats for possession. The flats rates are affordable but the builders will provide latest technological amenities to the people. The simple facilities would include gymnasium, pools, clubhouse and such other facilities for a comfortable living. The Antriksh Officers Enclave plan looks forward to make affordable living possible in Delhi. People can now buy a house in a comfortable rate. Home-related dreams will now find a destination at L Zone, Dwarka. A large number of government employees get quarters or homes to live in during their service. However, they have to vacate the quarters after retirement as it is entitled to the government. These highly respectable officials can now purchase a home for their family and live with them in their own house. The Antriksh Officers Enclave plan will provide 24x7 water and internet connectivity and power supply for ease of living. The starting price of the flats under the projects is Rs 31.9 lakhs. The Antriksh Group has delivered over a 50 successful housing plans in various in Delhi and NCR. The Antriksh Officers enclave plan is ongoing and one can be assured that Antriskh Officers Enclave would be another great project by the esteemed Antriskh Group. They follow a single motto i.e, they work hard for the comfort of the people and would do anything to make comfortable living possible for people especially the retired government employees. Thus, look out for the registration forms for the officer’s enclave project and get a chance to enjoy luxury living in budget friendly rates. Antriksh Group. Simple theme. Powered by Blogger.